Comedies, sometimes even more than dramas, are generally saying something about the human condition, even amidst the humor. That leads to some wise, if unexpected insight. Sitcoms and laugh-out-loud movies may not be where you expect to find sage advice or solace, but they have the potential to reveal things to you that nothing and no one else has. Almost any comedy, such as aforementioned sitcom Everybody Loves Raymond, is built upon mocking that which we fear in real life. Comedy is an escape, helping to simplify and, of course, alleviate the struggles of a very complex, serious world. Most sitcoms distill relationships in a way that pulls the humor out of difficult situations, hence the term they’re short for, “situational comedy.” In truth, however, there’s a lot of pain and frustration to the problems that are typically resolved on television in a single episode. In real life, something as innocuous as an argument about taking out the trash can have a lasting effect on a marriage. A sitcom trope like an unwanted kiss from a colleague will prove even more damaging. Outside of television, those type of issues don’t always have quick, simple solutions. Problems aren’t solved in 22 minutes, the length of a typical sitcom without the commercials. In a lot of ways they never are. Not completely. Every action can potentially have a lasting impact, especially in a relationship. Even if someone apologizes for their mistake and they are forgiven, the hurt they caused still might permeate in the background. That isn’t to say that no one can move on. We can, but don’t expect things to be reset to the status quo every few days like on Everybody Loves Raymond. Or for life to be as funny. TV makes sense. It has logic, structure, rules and likable leading men… We have you. Like the affable Pete played by Paul Rudd, the uncomfortably meta Abed played by Danny Pudi understands some of the differences between sitcoms and real life. Whereas a TV show follows a consistent pattern (usually the three-act structure) real life doesn’t tend to be so simple. Things that happen in our life don’t always have a point, sometimes real life people don’t act “in character,” etc. This inconsistency can be depressing, but it can also be freeing. Life isn’t predictable. Our destinies are in our hands. The quote also addresses how just because you’re the star of your story doesn’t mean you’re the good guy. That’s tough to accept, but by realizing it you can start to take steps to become the hero instead of the villain. I don’t want somebody sucking up to me because they think I am going to help their career. I want them sucking up to me because they genuinely love me. We all seek praise and affirmation from others. But, as the boss at the Scranton, Pennsylvania branch of Dunder Mifflin so inelegantly puts it, we only want it if it’s given out of love. It doesn’t matter so much if we’re being lied to. We can live with that. But if the intentions of others to lie to us to aren’t altruistic, we feel betrayed. In other words, if you want something from us, don’t just shower us with compliments. Make us feel loved. Then we’ll do pretty much anything you ask of us. Look. Just give me some inner peace, or I’ll mop the floor with ya! Similar to how Homer threatens his spirit animal, we often feel the need to use force to find happiness. That sounds paradoxical, and it absolutely is. Most strategies for reaching tranquility (like Hinduism’s Ten Commandments for Peace of Mind) involve turning the other cheek, forgiving people who wronged you and other nonaggressive acts. Fight against your human instincts and remember that to attain peace you must seek it out in a calm, collected way instead of out of anger. Butters: Well yeah, and I’m sad, but at the same time I’m really happy that something could make me feel that sad. It’s like, it makes me feel alive, you know? It makes me feel human. And the only way I could feel this sad now is if I felt somethin’ really good before. So I have to take the bad with the good, so I guess what I’m feelin’ is like a, beautiful sadness. I guess that sounds stupid. Despite what Goth Kid 2 might think, Leopold “Butters” Stotch has a point. In some ways, being sad should remind us of how happy we can be. This is particularly true when it comes to loss. Butters was heartbroken by the waitress at Raisins because he wouldn’t get to have new wonderful experiences with her, but it helped him remember how great he could feel, and can feel someday again. Even though he’s been ten years old for years, Butters understands that life’s too short to stay sad for long. When someone passes away we cry because we remember time with them and are sad that we won’t be able to creature new memories. But our response to their death should remind us how much joy they brought to our lives. Listen to the crudely animated ten-year-old. When you’re sad, treat that pain as a reminder of how happy you can be so you can live life to the fullest. 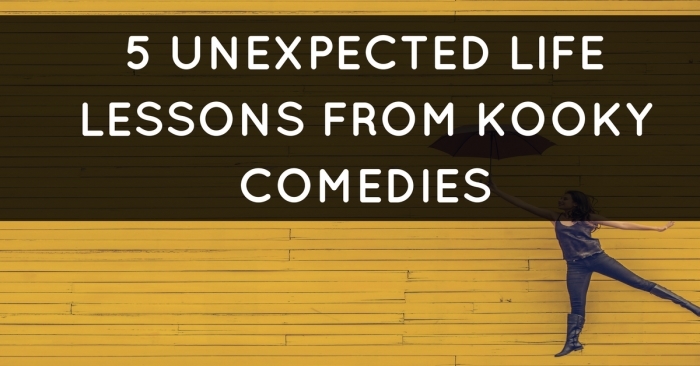 You might not expect to learn about life and living from sources South Park or Knocked Up, but they can teach you a lot between and sometimes during the punchlines. You just have to be willing to listen. Are there any comedies that you’ve found inspirational quotes from? Share them in the comments!